The latest data from English UK reveals a third consecutive year of declining English Language Teaching (ELT) enrolments for British providers. “The industry has already been undergoing seismic structural shifts as it matures, with competition between host countries coming into ever-sharper focus. To this, we can now add the uncertainty created by external factors including the UK’s exit from the European Union, elections in Europe and ‘Trumpism’,” said English UK’s Chief Executive Sarah Cooper. The 441 reporting members for this year – 73 public centres and 368 private-sector schools – welcomed nearly 477,000 students and delivered 1.79 million student weeks of instruction. This works out to a 11% year-over-year drop in enrolment and a 13% decline in student weeks. Overall, the annual volume of student weeks fell 24% between 2014 and 2016. English UK is careful to note that the number of reporting members varies from year to year and this plays a part in fluctuating business volumes. There were 24 fewer UK centres in the 2016 survey, mainly owing to closures or mergers during the year. Looking just at the 433 members who responded in both 2015 and 2016, the overall decline in student weeks moderates to -10%. Private-sector members tend to report more detail on their respective enrolments, and, looking just at those 368 centres this year, English UK flags a couple of important trends. In spite of a nearly 13% drop in student weeks, Italy remains the leading sending market for British ELT. However, Saudi Arabia comes in as the fastest-growing market for this year (up by nearly 17%) and has become the second-largest source market for the UK. Due in part to weakening numbers from both Turkey and South Korea, China edged into the top five sending markets for the first time in 2016. More broadly, nearly half of all British ELT student weeks (47%) are delivered to students from Western Europe. 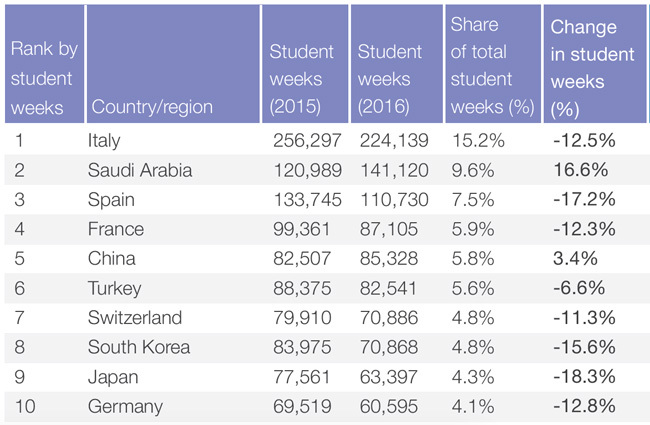 Except for Australasia, which registered growth on a very small base of student weeks, all global regions declined in terms of both weeks and, except for North America and the Middle East, student numbers as well. “The biggest decline was noticed in the number of students from Eastern Europe, which could be attributed to students from these countries opting for other destinations (e.g., Ireland),” notes the English UK report. Also of note for 2016, for the first time there were more junior than adult students in British ELT. By head count enrolment, 51% of all ELT students were juniors last year. Adult learners, however, continue to account for the lion’s share of student weeks, roughly 70% compared to just under 30% for juniors. “2016 is the first year in which (marginally) more junior students studied English in the UK than adults. An increasing number of our member centres are responding to this demand by offering courses for young learners,” notes English UK Marketing Director Annie Wright in the report’s concluding comments. a new quarterly statistics programme, the Quarterly Intelligence Cohort (QUIC), that will provide members with timely data to support more timely market planning and performance benchmarking. These initiatives are meant to respond to the challenging trading conditions that British ELT providers have been facing in recent years, including tightening visa policies and the political fallout from the Brexit vote. But English UK, and its member centres, are also working to address the broader context of the global ELT market. As the segment has moved into a more mature phase in recent years, annual global growth in ELT has slowed. We now increasingly see a pattern where, as opposed to overall global growth, market share shifts among destinations – and the fortunes of individual host countries rises and fall – due to changing economic or political conditions, shifting currency values, or expanded recruitment marketing. This entry was posted in Europe, Language Learning, Regions, United Kingdom and tagged international enrolment in the UK, English language programmes, language studies, foreign language learning, international students in UK.